Swansea City continued their unbeaten start to 2019 with a 1-0 win against promotion hopefuls Sheffield United which moved the Swans up to 9th in the table. Graham Potter opted to bring Oli McBurnie back after illness to replace Courtney Baker-Richardson with Daniel James who has been linked strongly with Leeds held in reserve. Sheffield United named an unchanged team as they looked to move back into the automatic promotion places. The opening 20 minutes of the game was a case of both teams feeling each other out with United having the marginally better of it with John Fleck and Mark Duffy getting on the ball in midfield. The Swans were then dealt a blow as Joe Rodon went off with what we found out was a broken metatarsal as Cameron Carter-Vickers came on to replace him. Shortly after the injury, United started to impose their style on Swansea and it was Duffy heavily involved again as he played in Enda Stevens whose excellent cross found the prolific Billy Sharp but from point-blank range, his shot was too central and it gave Mulder the opportunity to make an excellent save. United were looking good all over the pitch with the Swans rattled and struggling to string a sequence of passes together. Duffy was the source of all Sheffield United’s good play and it was his pinpoint cross that found McGoldrick in the box but his header went wide when he should have done better from the penalty spot. Swansea were looking like a team who needed half time and having survived a deflected shot that had Mulder called into action again they made it to the break fortunate to be 0-0. With his team needing a change of approach and personnel, Potter opted to bring on Dan James for the injured Wayne Routledge with the winger deployed as a central striker with McBurnie on the left. The second half began with Swansea showing a lot more purpose with James’s pace stretching the United back line and giving them something to think about. They almost took the lead during this phase of play from a set piece as a brilliantly struck Matt Grimes free kick went just over. The game was becoming stretched and it was suiting Swansea as they applied constant pressure and the reward came just after the hour. A Swansea corner was cleared away but directed back towards the box by Grimes, Dyer picked the ball up and after an exchange with van der Hoorn played a wonderful cross which was fired home by McBurnie with the strikers near post run timed perfectly. Swansea were sensing blood and after some half chances, the ball found James in the box but his goal-bound shot was well saved by Dean Henderson. At 1-0 the game is rarely safe and United, having thrown on Leon Clarke and Gary Madine, were still looking a threat as they resorted to long balls into the Swansea box. 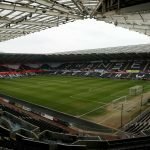 Swansea’s resolute defence were up to the task and despite some heavy pressure, there were no real opportunities for United as Swansea picked up the win to continue their momentum.